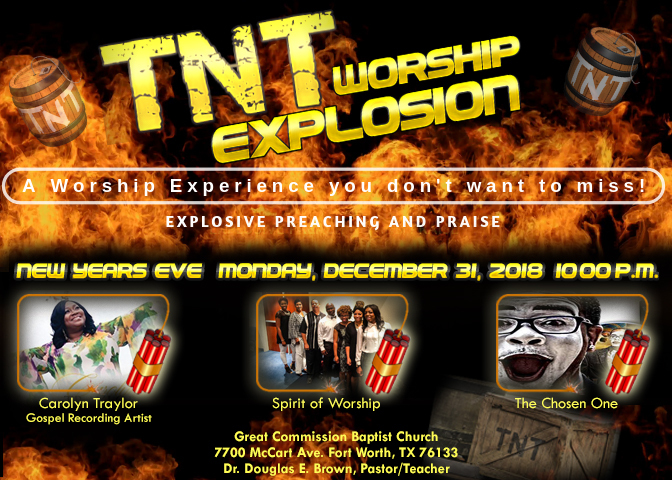 TNT Worship Explosion, New Year’s Eve at 10:00 p.m.
GCBC Family and Friends are invited to TNT Worship Explosion, New Year’s Eve at 10:00 p.m. at Great Commission Baptist Church, 7700 McCart Ave, Fort Worth Tx. It’s a Worship Experience you don’t want to miss!! Invite everyone you know! Line up; Spirit of Worship, Voices of Praise Choir, No Words Mime Ministry, The Chosen One.